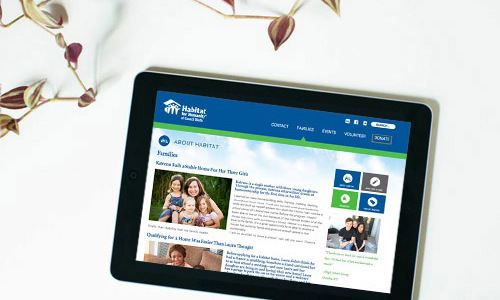 E Creative engaged me to write the copy for Habitat for Humanity Council Bluff’s new website. We work to revitalize neighborhoods in the Council Bluffs community. To that end, we have been building simple, decent, affordable homes since 1993. We’ve finished 87 homes in our 20 years of service. How do we do it? By providing no-profit, no-interest mortgage loans and using innovative financing methods to qualifying families. And by inviting hundreds of volunteers from our own community to help build someone’s dream. If you can write a check, prepare a tasty lunch, pull weeds, swing a hammer or sort nuts and bolts, you can be a part of building a better Council Bluffs. Join your neighbors on a Habitat project now! Informational pages throughout the site encourage people to apply for a home, even if they think they don’t qualify. The site also includes several homeowner stories to show the human side of their mission, and to remind readers that Habitat’s work changes the lives of real people in their own community.